Europe's leaders hinted Friday they may be ready to ease the austerity push that threatens to snuff out growth for a second consecutive year. Portugal's bailout lenders, including its EU partners, said the country could have more time to meet targets for reducing its debt. The European Commission, European Central Bank and International Monetary Fund said a deeper-than-expected recession and higher unemployment were eating into Portugal's government revenues and requiring increased social spending. "The weaker growth prospects require an adjustment of the fiscal deficit path," the so-called troika of international lenders said in a joint statement. Portugal is in its third year of recession. Gross domestic product is forecast to shrink by 2.3%, after falling 3.2% last year and 1.6% in 2011. Growth should return in 2014, the troika said, but not before unemployment peaks at over 18%, up from 17.6% in January -- the third highest rate in Europe after Greece and Spain. In May 2011, Portugal was shut out of international bond markets when it became the third eurozone country after Greece and Ireland to seek a bailout with the EU and IMF. The original conditions of the €78 billion bailout program required painful spending cuts to bring down the budget deficit to 4.5% of GDP in 2012 and 3% in 2013. The targets were revised once last year, alongside those for Greece and Spain. 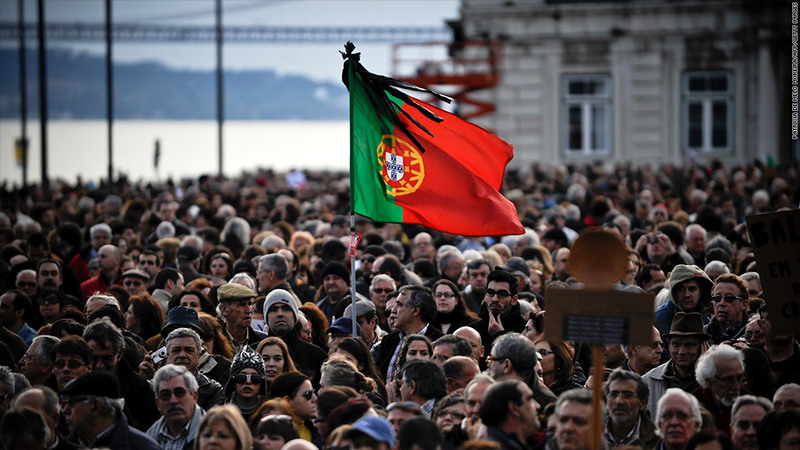 Under the agreement announced Friday, Portugal will be allowed to run a deficit of 5.5% in 2013. It will have until 2015 to bring the deficit down to 2.5%, below the 3% level defined as excessive in EU rules. Overall debt will peak at 124% of GDP in 2014, up from 108% in 2011. Ratings agency Standard & Poor's revised its outlook on Portugal to stable from negative earlier this month in anticipation of EU support for a more sustainable timetable. The decision to relax bailout terms comes as Europe faces growing calls to become more flexible in the implementation of its policy of putting fiscal discipline first, championed by Germany, Finland and other northern European countries. Record unemployment, a shock protest vote in recent elections in Italy, and pressure for greater emphasis on growth from countries such as France is already leading to a change in tone. France is set to miss its own deficit target this year as its economy stagnates. The 27 EU leaders agreed late Thursday that progress toward structurally-balanced budgets must continue. But they added there was room within EU fiscal rules for countries to enact "short-term targeted measures to boost growth and support job creation." "We are fully conscious of the debate, the mounting frustrations and even despair of the people," European Council President Herman van Rompuy told reporters. "We also know there are no easy answers. The only way out of the crisis is to keep tackling its root causes."